The origins of Club U44, or Friends of the Feistritztalbahn, came from a company outing to Birkfeld. During that trip on a special train, enthusiastic support grew for this loveable little railway. A group of enthusiasts from Graz got together, and on 10th December 1972 the first club statutes were drawn up. The Club was officially recognised on 22nd February 1973. The Club had an encouraging start when the maiden journey to Ratten took place on 20th May 1973, with 350 passengers enjoying the ride. The first big challenge for the Club came during 1994. At the end of 1993 the StLB stopped all traffic beyond Anger, and restricted its operations first to Weiz – Anger, and later to Weiz – Oberfeistritz. At this point the Club’s trains could also only travel as far as Anger, and massive reductions in passenger numbers could have easily meant the end of the Club’s actvities. 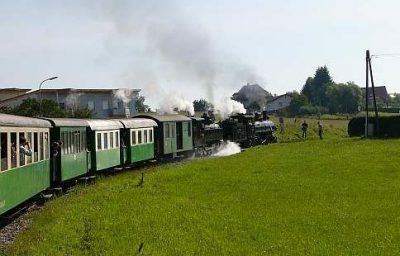 Fortunately, the Club was able to take control of the section of line from Oberfeistritz to Birkfeld, and obtained permission to continue to operate its special tourist trains. The Club continued to run this section of the line until the formation of the Feistritztalbahn operating company. The Feistritzalbahn operating company was formed in 1999, and the Club has returned to its original function – the spiritual and financial support of the line. This is now more important than ever before! Without our volunteers, either on the trains, or to maintain the track or rolling stock, our beloved FTB would not run for much longer! Hopefully, reading these words has inspired you to join us. If so, please contact us and we will be delighted to see some new faces somewhere between Weiz and Birkfeld!